I don’t know if those percentages are accurate or if this dog has any recent wolf ancestry at all. But it is said to howl. Norwegian elkhounds really don’t howl. They are know for their barks. I remember my grandpa’s elkhound would rake his back on the lower rung of a split-rail fence in the front yard, and he would bark each time he raked his back against the rail. I don’t know why anyone would puff an elkhound as being part wolf. 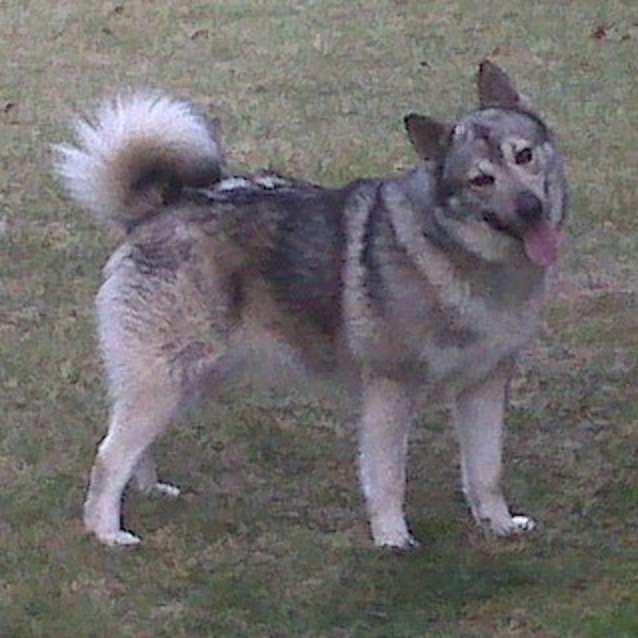 All Norwegian and Swedish elkhounds can have relatively recent wolf ancestry. I am skeptical that this particular dog is of recent wolf ancestry. It might be. It looks more like a wolf than the F1 poodle/wolf crosses that Erik Zimen bred. I can definitely say that the dog on the right is not a boxer. It is a bulldog. The other two dogs might be golden retrievers, but they are very light in the eyes. And one is unusually light in color for the time period. Such dogs existed but were generally frowned upon within the strain that became the golden retriever. I think these are retrievers, though, but they might not be “golden retrievers,” as in they are part of the same strain that became the modern golden retriever. There were strains of “white wavy-coated retriever” that existed independently of that strain, as did several strains that produced yellows and reds. These two dogs really could be golden retrievers as we know them today, or they could be from another strain of wavy-coated retriever. 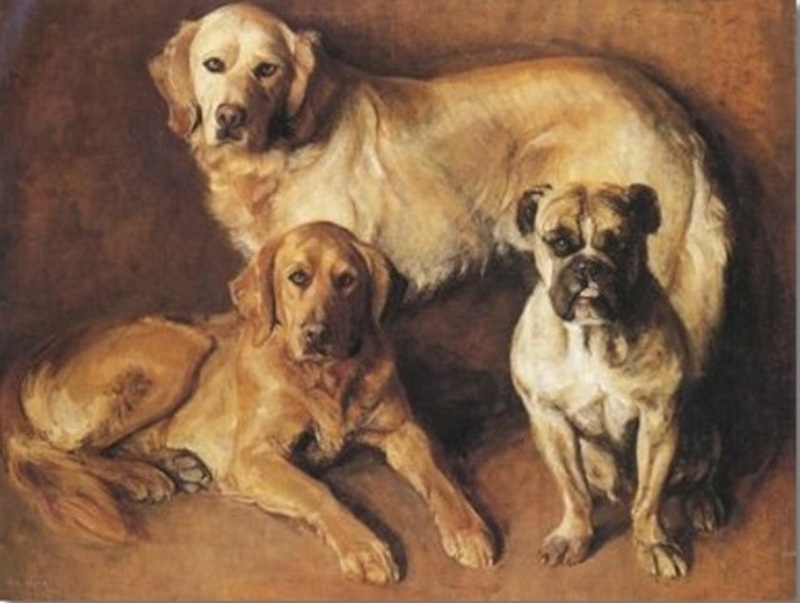 If anyone knows anything about this painting– year, artist, and the identity of these three dogs– it would be greatly appreciated if you could pass on this information. The image above come from Newfoundland and Its Untrodden Ways (1907) by John Guille Millais, an English artist, naturalist, and travel writer. He was an ardent conservationist and was instrumental in founding the Society for the Preservation of the Wild Fauna of the Empire, which now is Fauna & Flora International. Millais examined many different aspects of Newfoundland’s culture and natural history in this book, but he possessed a very strong British aversion to free-roaming dogs, seeing them as a major hindrance to developed a wool and mutton industry. The custom in Newfoundland was to allow the dogs to roam freely when they weren’t needed for work on the fishing boats. At the time Millais was exploring Newfoundland. At the time Millais was visiting Newfoundland (the autumn of 1900), the dogs really weren’t needed to haul and set nets and lines. The fishery was more or less mechanized. However, the dogs still were needed to haul loads, especially lumber, and they were of great utility in retrieving ducks and sea birds. 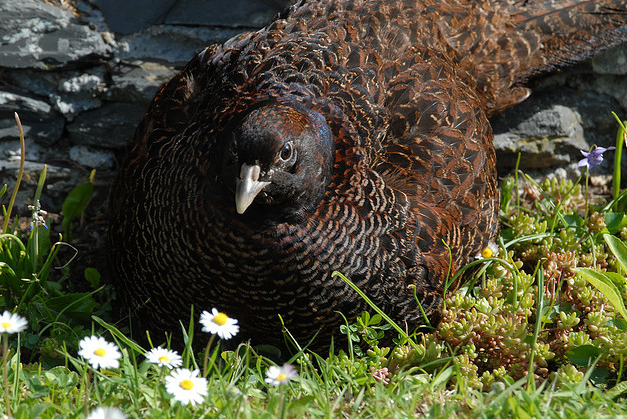 They were also used to hunt rock and willow ptarmigan and spruce grouse in the island’s interior. They were also good for retrieving shot seals, and they also could be used to hunt snowshoe hares, which were introduced to the island in the 1870’s. In Labrador, they were used for all the above tasks, but they were also used as sled dogs– often cross-bred with the indigenous hauling breed, which we now call the Labrador husky. The dogs were the product of a people fully dependent upon the natural world for survival. They needed the dogs for a wide variety of tasks. The notion that one should try to control one’s dogs at all time made little sense to people who were accustomed to letting them roam and learn about nature on their own. Because Millais was writing about the dogs during his visit in 1900, we can also see exactly how effective the Sheep Protection Act of 1885 actually was. This is the act that is often said to be the main force behind making the St. John’s water dog extinct, for it allowed different municipalities in Newfoundland to levy high dog taxes and even ban dog ownership outright. However, the municipality had to have some interest in promoting sheep production in the first place, and in the outports, the dogs continued to be kept as they always had been. And it was that way until the 1970’s, when the last “pure” St. John’s water dogs died. 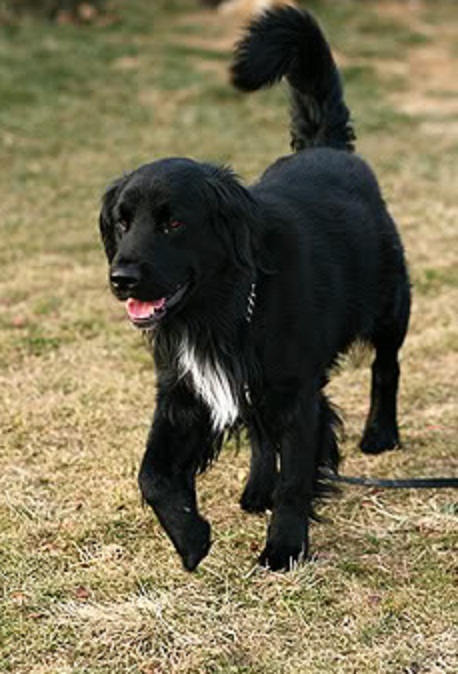 Contingents of free-roaming black water dogs still exist in some parts of Newfoundland, but these are almost entirely modern Labrador retriever in ancestry. The dogs, which seem to be well nigh amphibious, rush barking through the pools, and at low water search the shores for discarded cod-heads. The best dogs are of the “Labrador” type. In winter they are used for hauling logs—one dog will haul 2 or 3 cwt. Seldom more than two are used together. 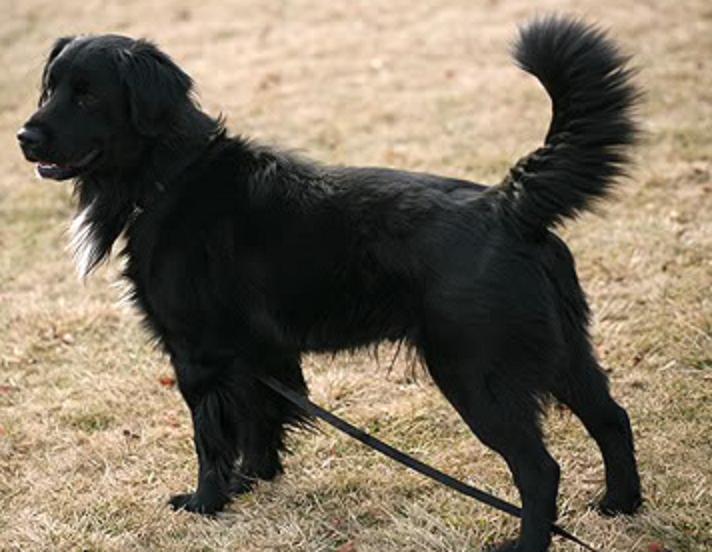 The pure Newfoundland dogs are curly, and are a little higher on the leg than are the Labradors (pg. 145). 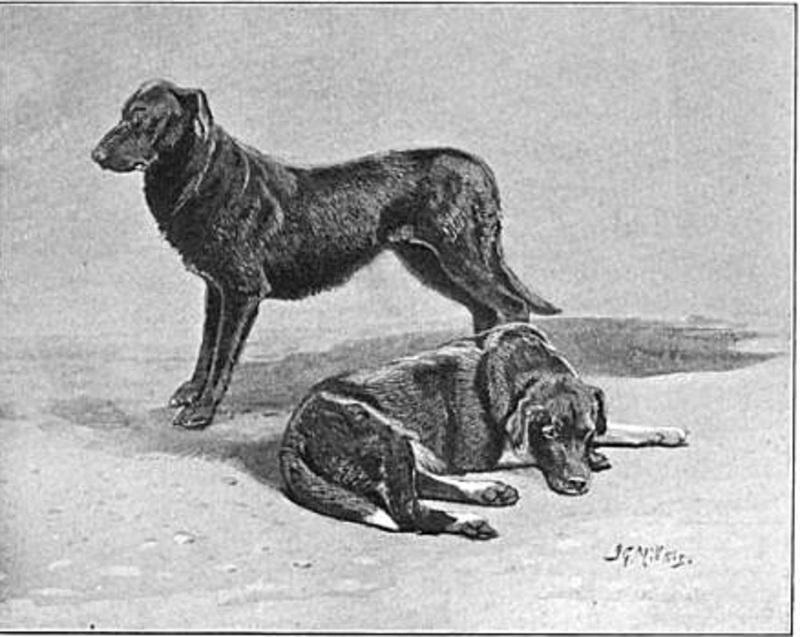 I have never heard of this distinction anywhere else in the literature, but because these outport communities were quite isolated– as were virtually all settlements in Newfoundland and Labrador– it seems to me likely that each community would produce a slightly different type of their working dogs. There is no mention of long-haired dogs, which I think were largely exported to Britain and the United States, to found the retriever and large Newfoundland breeds. And there is no mention of giant Newfoundlands on the island. The only distinctions between the dogs are of leg length and coat type– not size. There may have been giant dogs on Newfoundland at one time, and it is well-known that the modern large Newfoundland is a powerful animal. However, one gets a bit of diminishing returns when a dog hits that size. Yes, the big Newfoundland can haul more massive loads, but a dog of that size overheats more easily. Even in Newfoundland, it can get warm enough to make a dog overheat. Further, a giant dog eats a lot of food. If one reads any history of dogs in Newfoundland, the dogs ate mostly cast off meat and fish. A giant dog would have a hard time finding enough nutrition to fully thrive in those conditions. It also wouldn’t be so nice to have such a large dog on a fishing boat, where conditions are quite cramped. I think the bulk of the evidence suggests that the giant Newfoundland dog was really a creation of Europe and the United States. There may have been some larger dog on the island with long-hair, but these likely weren’t significantly larger than St. John’s water dog type. From these dogs the giant Newfoundland was developed. Of course, all of this is debatable, and it has been quite hotly contested since the early nineteenth century. “What is the ‘true’ Newfoundland dog?’ is a question that has resulted in many, many arguments. And none of it is settled. Keep in mind that much of what we know about these dogs comes from Europeans who never saw these dogs in Newfoundland, and their perspectives might be quite inaccurate. But the St. John’s water dog or “Labrador” was a truly rugged creature. By the accidents of history, it lived as dogs had for millennia. The humans who owned these dogs were primarily hunters, trappers, and fishermen. Some did a little small farming. Some kept some sheep and cattle. Many more kept chickens. But wild nature was the primary source for their sustenance, and they needed a dog that could be as well-versed in nature’s savagery as they were in taking commands. 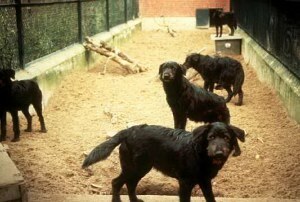 Hunting man domesticated the dog, and these dogs lived with hunting man. Unlike many other dogs in the same cultural situation, these people were Westerners whose native tongue was English. They were mostly refugees from an industrial and late mercantile society, who had come to this wild country in the northwestern Atlantic to live as free men. Large-scale agriculture was something they largely shunned. They didn’t need collies or farm dogs. They needed dogs that could hunt and swim. And that’s what the St. John’s water dog became. 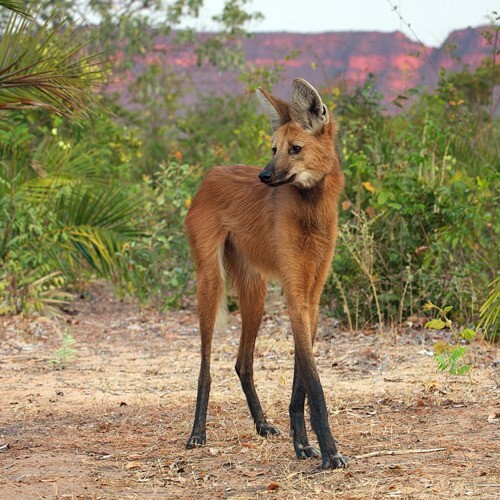 The perfect name for the maned wolf! 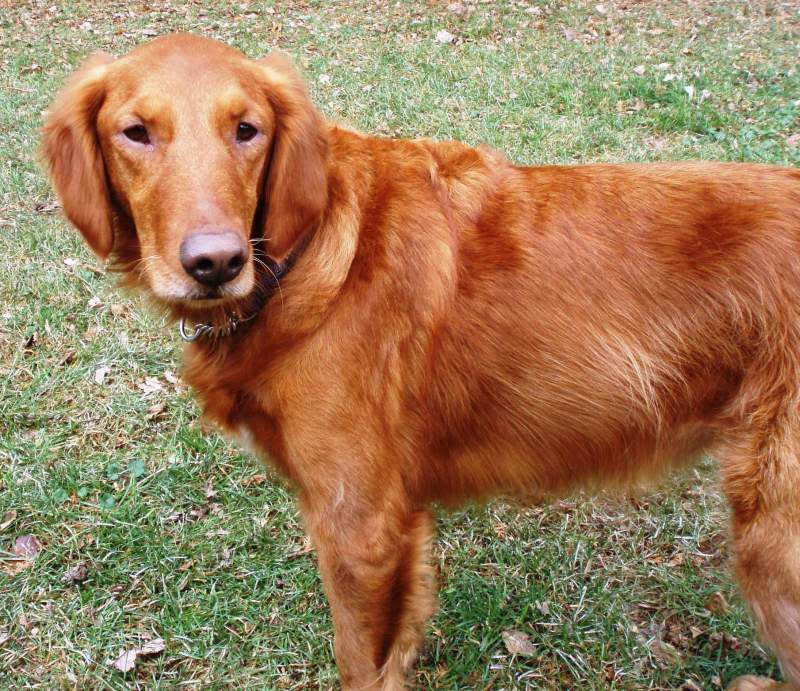 This particular golden looks like a red flat-coated retriever. Brown skinned dogs are genetically livers or chocolates that have the e/e genotype that prevents the brown pigment from appearing on the coat.